I am scrambling to put things together for the list this month. November came and went in a flash. Here goes…. 1) It seems like as soon as the cold weather came through, we got the decorating bug again. We got dining room furniture (finally!) which took forever to pick out. Our table had to be just the right size and it had to extend to just the right size for larger gatherings. And it had to not be too formal (my request) or too rustic (husband’s request), but in the end we did go with a distressed one because it fit (lucky me). My husband got the final say in the chairs (although I picked the color) because we went with my choice for the kitchen/family room (see below) last year. They are a bit formal for me BUT I have to say I really, really like them. I almost went with a light plum with the color instead of mustard, but that was more of a risk and I’m not much of a risk-taker when it comes to decor. …which we’ve been wanting for a long time. My husband has taken a liking to scotch (which is very Grosse Pointe of him). I love the concept of drinking scotch or whiskey – the different bottles and the square ice cubes and the cool glassware. But unfortunately I don’t love the taste. And yes, it’s beginning to look a lot like Christmas. A lot of these photos were taken just today because like I mentioned, I am behind on everything. 3) Which brings me to my next decorating obsession: trays (see the round one on the bar?). I bought a tray for the living room, for the powder room, for the master bathroom. How have I gone my whole life without trays?! 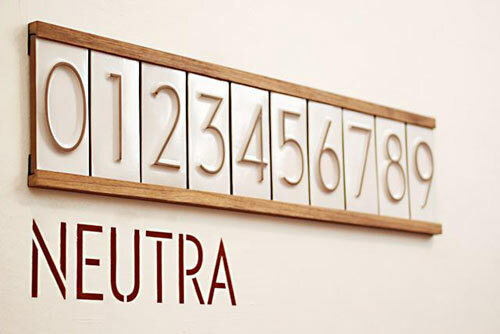 4) We replaced house number plaque that the former owners put up, with Heath Ceramics house numbers. It was quite the project. The old plaque was stuck there with tons of epoxy, which my husband spent all day taking off with various tools, electric and non. They are gorgeous. 5) Now our maroon front door looks extra out of place. Our painter was here yesterday (I know, I know. Separate post) and I asked him what he thought. He said he would definitely paint the sidelights (new vocab word for me) the trim color and not make it the same color as the door. I’d never thought of that and it seems like a great idea to me. Here’s an example of painted and unpainted (not my house, obviously). What do you think? Here’s our actual door (I can’t even talk about the doormat/rug right now so don’t ask). 6) I’m hosted book group last night and I loved the book, but I can’t tell you what it was because I’m giving it as a Christmas gift. So I give you this book instead. it’s the first in a trilogy. I’m on the third one. It’s a great read if you like light fantasy (elements of magic, but not too crazy). I guess you could say it is Harry Potter-esque, but it is also very different. More grown up (which doesn’t necessarily mean better. I did love Harry Potter). The second was just okay, but I am getting into the third book. Hopefully the ending will not disappoint. 7) We got our first snow of the season on the 21st. Our littlest ran outside as soon as it started to fall (if you look closely you can see snowflakes in her hair). It didn’t start sticking until evening and we didn’t get a whole lot, but there was enough to play in for a day or two and make a small snowman. 8) I finally saw a show at the historic Fox Theatre in downtown Detroit. The girls and I were invited to go see “How the Grinch Stole Christmas” with another mom and two other girls. The girls were just adorable and the theatre is beautiful. We had a suite, which was extra awesome. 9) Earlier this year, I won a blow out party at the salon I go to, Chez Lou Lou (which hands down has given me the best haircuts ever, even compared to the six different hair stylists I had in San Francisco). I redeemed the prize this month. A handful of gals and I were treated to champagne, tea/scones and had our hair done. Then we went to the Yacht Club for dinner and walked around their Holiday Mart. 10) Speaking of Holiday Mart, it seems like every time I turn around I see a sign for a different Holiday Mart. The War Memorial, churches, libraries, clubs, you name it. I don’t think I went to (or heard of) one Holiday Mart in San Francisco. You either shop in your neighborhood or online. 11) We raked leaves for the last time this past weekend (the last week for leaf collection by the city was this week). Our birch tree is still dropping leaves (you can see it in the pic), but all our other trees (except the evergreens, of course) are bare. 12) We had a great thanksgiving with my husband’s side of the family. We started with appetizers and a champagne toast (for my husband’s birthday) at Uncle Jim’s and then went to the Yacht Club for our meal. There were 19 of us! One baby, five kids and 13 adults. It was my first time having Thanksgiving at a restaurant, but it was pretty nice and of course there is no prep or clean up, which is fantastic. This post had a lot of “stuff” in it. Furniture, accessories, theatre tickets, holiday marts. I am grateful for all of it but I thank my lucky stars even more for the non-material things – a roof over my head, a safe neighborhood, healthy kids, a family who loves me. The list goes on and on. Enjoy your December and I will see you back here soon with another post about paint! This entry was posted in Family, Fun, Grosse Pointe and tagged 2015, Diary, Fall, Grosse Pointe, Lifestyle, November, Personal, Small Town, The List. Bookmark the permalink.